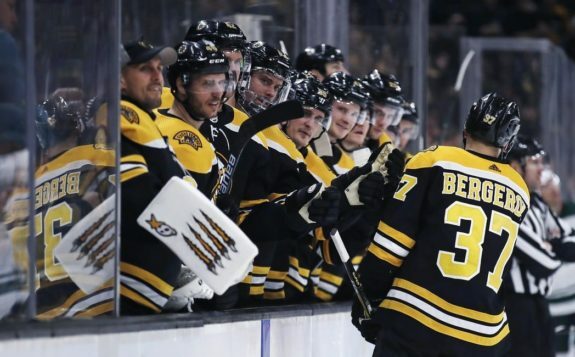 BOSTON — Patrice Bergeron and Brad Marchand each had a goal and two assists, Tuukka Rask stopped 24 shots for his first shutout this season and the Boston Bruins beat the Minnesota Wild 4-0 on Tuesday night. Danton Heinen and Jake DeBrusk also scored as Boston won its season-high fifth straight game. John Moore and Torey Krug had two assists apiece. DeBrusk added a power-play goal with 45 seconds left in the first, with assists going to Bergeron and Marchand. NOTES: Rask needs three wins to pass Cecil “Tiny” Thompson’s club record of 252. . Boston D Charlie McAvoy missed his sixth straight game with a lower-body injury. . Stalock got the start for Devan Dubnyk, who made 32 saves Monday night at Montreal for his first shutout of the season. Dubnyk will represent the Wild at the All-Star Game for the third time in four seasons. . The Wild fell to 8-4 in Boston.